At $13.54 trillion, consumer debt today is $869 billion higher than its 2008 peak of $12.68 trillion. It is 21.4% higher than its 2013 trough (see chart). Housing is not the culprit this time around. Based on a recent report from the Federal Reserve Bank of New York, mortgage balances were essentially unchanged from September 30, 2018 to year-end and home equity lines of credit (HELOCs) have been on a downward trend since 2009. In fact, at $412 billion, HELOCs are now at there lowest level in 14 years. However, after increasing $26 billion in the fourth quarter, credit card balances have again reached their 2008 peak of $870 billion. The aggregate credit card limit also rose, – for the 24th consecutive quarter. In addition, student loan balances increased by $15 billion and auto loans increased $9 billion. While we clearly are not shying away from debt, the report also stated that account closings are at their highest level since 2010 and inquiries are at their lowest level since the data has been collected, which indicates a waning demand. While household debt is at levels never before seen in this country, delinquency rates remain relatively steady at 4.7%. Of that, about two-thirds is seriously delinquent (at least 90 days past due). Student loan debt. 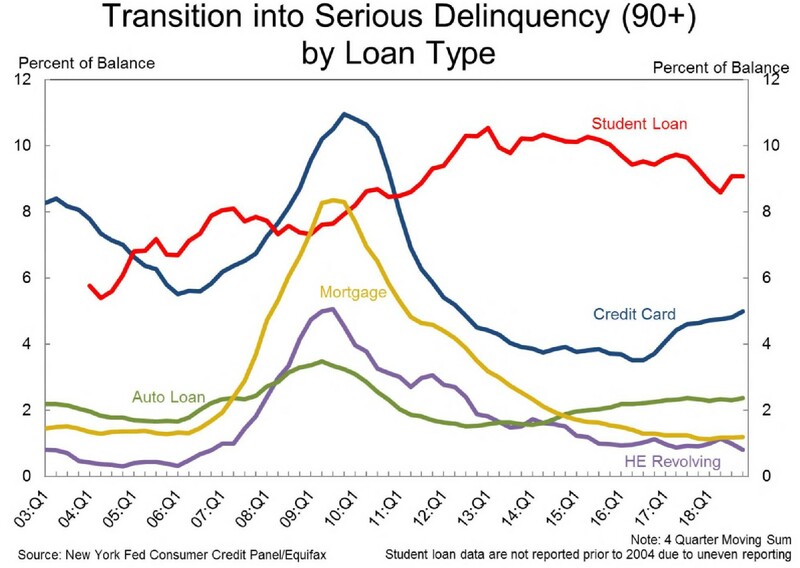 Nearly 11½% of aggregate student loan debt is 90 days or more delinquent or in default. Credit card debt. 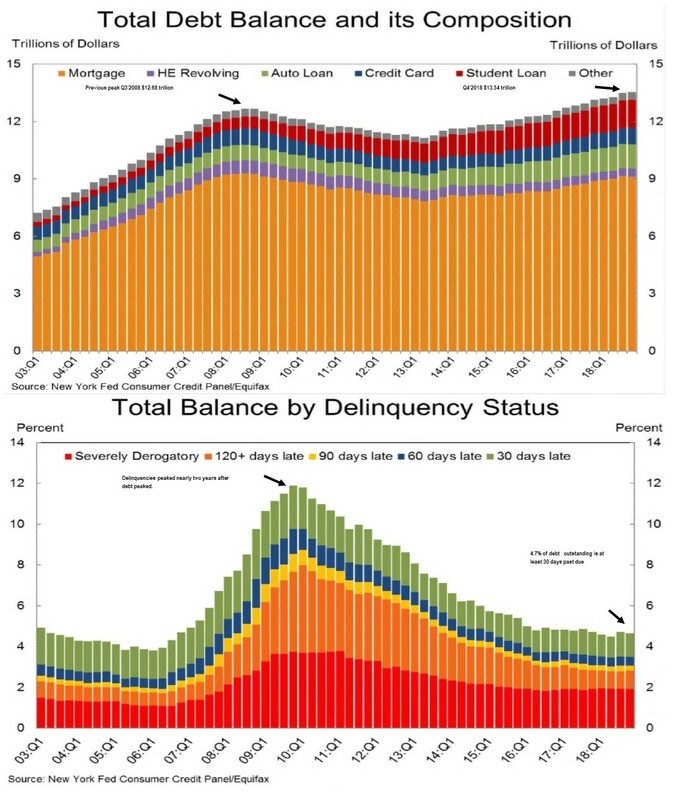 Credit card balances flowing into the 90+ delinquent category has been climbing since 2017. Auto loans. Auto loans that are delinquent 90 days or more has been trending up for the past seven years. 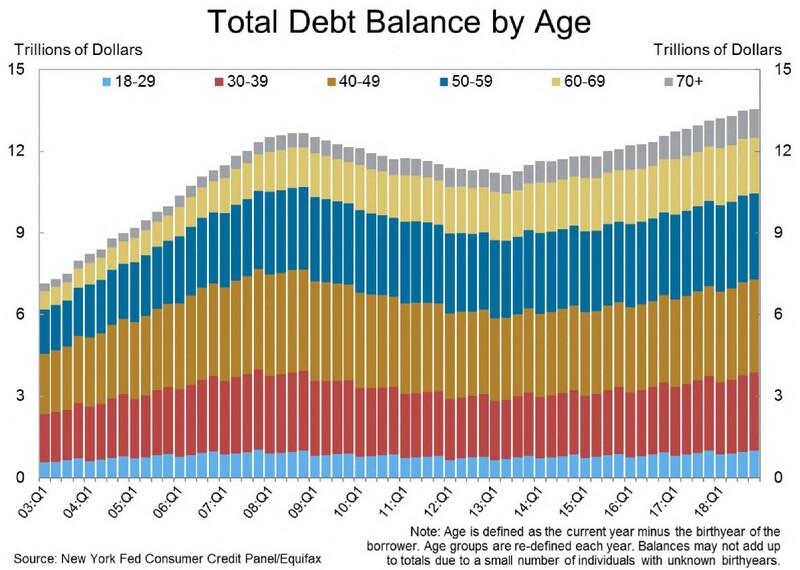 The NY Fed report also breaks debt down into age groups. 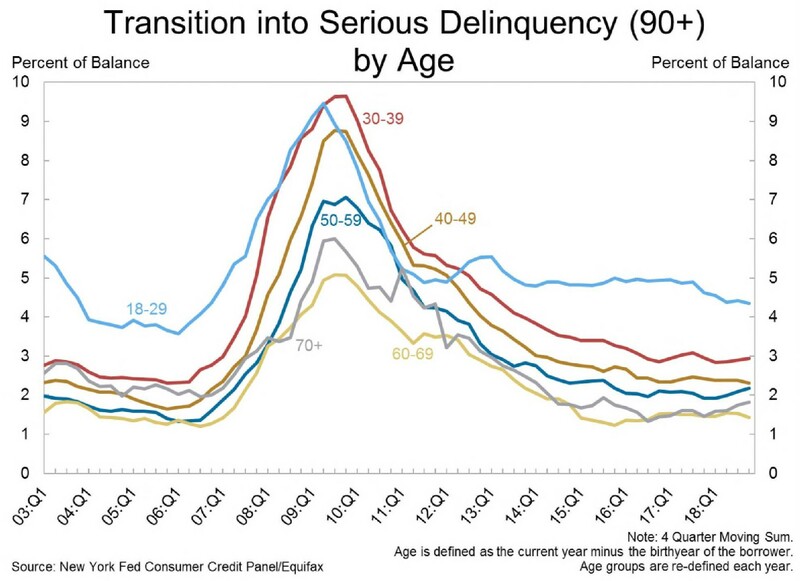 Different types of loans are more likely to transition into serious delinquency (90 days or more) for a specific age group. For student loan debt, that age is group is from 40 to 49. For credit cards and auto loans, people aged 18-29 are more likely to slip into serious delinquency. One thing we found particularly disconcerting, however, was how much debt our seniors are taking on. 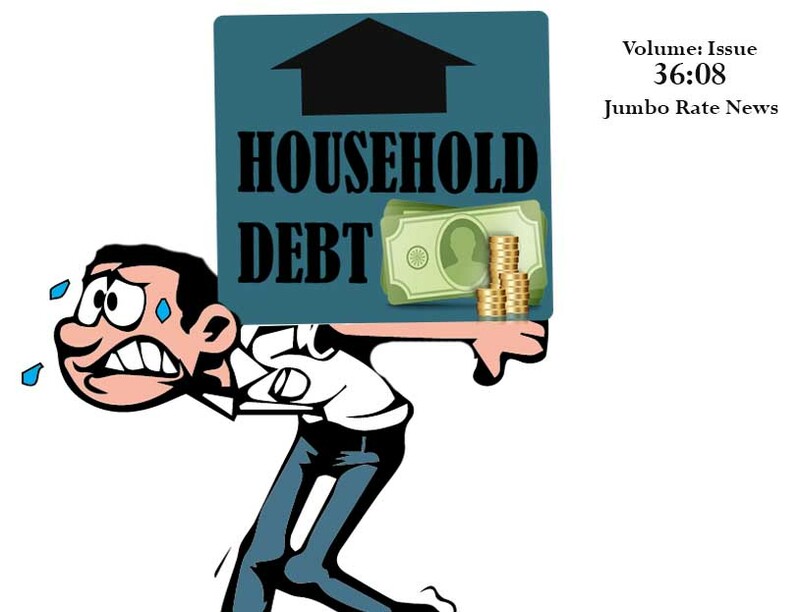 Over the past 15 years, debt at households of the 70 plus age group has been steadily rising, as is the 60-69 age group. Part of the large debt share for seniors is HELOCs. This makes sense, as they tap into the equity of their house for home repairs or medical expenses. Seniors also have a higher share of their debt in credit cards than younger adults and are least likely to fall into serious delinquency. Note on the second graph that, during the Great Recession, delinquencies hit their peak nearly two years after household debt peaked. That’s something we will continue to monitor. Read the full report on the FRB NY’s blog.